Home » Can Solar Panels Work at Night? Then, How is It Possible That My Neighbor’s House is Powered at Night By Solar Energy? Will Solar Panels Ever Produce Electricity at Night? Maybe you have heard a friend or neighbor saying that he uses solar energy to power his house at night. That probably raises the question in your mind, can solar panels truly work at night? Some people get confused with this simple way that we commonly refer to solar energy and how we use it. However, to answer this question briefly, we will give you a little technical approach on how electricity is generated from solar panels. Solar panels are electronic devices designed with an aluminum frame, glass, wires, and semiconducting materials that are placed in thin layers called solar cells. The semiconducting material used by excellence in solar panels is silicon, one of the most abundant semiconductors in the Earth. 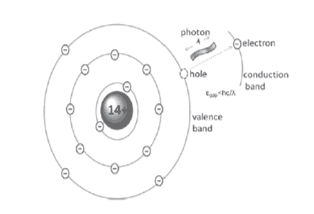 The silicon has a crystal structure composed of strong bonds between atoms. However, by adding or “doping” the structure with other components such as boron and phosphorous, it is possible to increase the conductivity of the layer. In other words, increases the amount of electricity that can be generated. Now, sunlight can be described as a particle or a wave. If we refer to sunlight as a particle, then we are referring to atom level particles called photons that impact the surface of the Earth every instant during the day. When these photons reach the silicon solar cell doped with boron and phosphorous, they release free charge carriers (called electrons). The movement of electrons leads to the generation of electricity, therefore, while more electrons are released, more power is generated. Summarizing, photons reach the surface of the solar panel, photon’s kinetic energy is transmitted to electrons, releases electrons, generates electricity, and they are then conducted to harnessing points called busbars that are connected to the output of the PV cell. As you can see, the main source of energy in photovoltaic electricity is the kinetic energy of the photons. Therefore, if there is no sunlight, then there are non-photons. If there are non-photons, then it is impossible to harness electricity from solar panels. Solar energy harnessing has a particular curve shape that can be usually simulated as a Gaussian Curve. As you can see above, solar harnessing starts producing a little energy in the early hours, maximizes its production during midday, and reduces as evening hours get closer. However, in many instances, solar energy production exceeds the consumption during midday hours when loads are low because you are outside of the house working or doing businesses. Then, the patterns of consumption generally increase at night, when we turn on the lights of our homes, turn on the TV, start cooking, doing laundry, etc. Unfortunately, solar energy is no longer being generated by then. Since these two peaks of generation and consumption cannot be mixed, a solution needed to be put in place to make the balance of electricity possible. Actually, in the US, there are two solutions for this issue: Net Metering and Energy Storage. The Net Metering scheme allows any homeowner or user that produces excess solar energy during the day to sell it to the utility grid and receive a credit for the electricity injected on the energy bill. In other words, the credit offsets any consumed electricity from the grid overnight, it translates into a reduction of the energy bill cost every month. The problem with net metering is that the tariff or credit that you obtain to offset your production overnight changes from State to State and from time to time in the US. Some States also have capacity limits that can be applied for distributed energy generation, others have restrictions in renewable energy sources that can apply, and others simply do not have that scheme. However, around 38 States have implemented the Net Metering policy, so it’s not a bad number either as you can see below. Other States have special tariff rates, like Minnesota and Texas (specifically Austin). These offer a Value of Solar rate that take into account not only the energy injected to the grid, but also the benefits that solar energy offers to balance the grid every day. The main difference with Net Metering is that Value of Solar rate is fixed over 20 years, which offers stability in your electricity earnings. The other solution that came out to the market was to install PV systems with batteries for backup. These systems are usually called grid-tied with battery backup because they do not normally work off-grid, yet when there is a blackout they can power your house. Coupling energy storage with PV systems has become very popular thanks to the appearance of hybrid inverters that do not require the presence of a charge controller that increases costs. They are also popular now thanks to companies like Tesla, LG Chem, and Sonnen that have promoted lithium-ion batteries that are more efficient, safer, occupy less space, last longer, and are certainly prettier than previous lead-acid battery models. Based on this approach, some solar designers take into account the use of batteries to improve your self-consumption. The reason for this is that sometimes, net metering schemes may not compensate you enough for the value of solar energy when compared to the electricity rate that you must pay later. That’s how models like the AC battery from Enphase Energy came out. They do not provide backup, but they save the excess energy generated during the day to use it later at night. However, when comparing the extra capital costs of improving self-consumption through a battery with the earnings obtained by saving your solar energy for later use, the average answer is that it is not worth it. Therefore, the true purpose of adding a battery must be to provide safety against blackouts to your house or business, and the additional benefit must be that you can increase your self-consumption and possibly obtain better savings in the long term. Now you know that the “solar energy” used by your neighbor at night is actually stored in batteries or in the grid (Net Metering case). But, will it be possible that solar panels eventually come to generate electricity at night as well? That would be amazing, right? Nevertheless, there are still no signs that it can be possible (in the near future, at least). Attempts of technologies that approach this idea are the nanoantennas from the Idaho National Laboratory that tried to harvest energy from the Sun using the heat generated during the day to generate it later at night, but that research got lost in time because it was from 2008 and we never saw it on the market. Other technologies as Solar Thermophotovoltaics (STPV) may be able to use the heat during the day to produce electricity for later use, however, it is still too soon to jump to conclusions. Time will let us know if it can be possible!